Srinagar.The Hurriyet leader and vice chairman,h! Syed Aijaz Rehmani has strongly condemned the arrest of its Chairman, Mukhtar Ahmad Waza and detention of other resistance leaders in jails and houses. 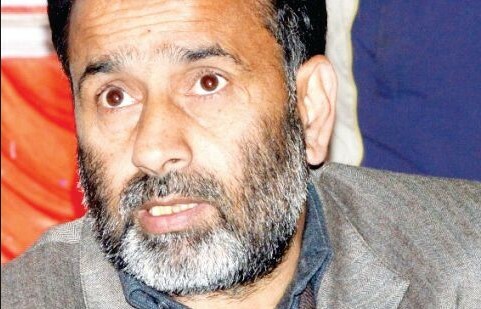 Aijaz rehmani in a statement said that the illegal detention and curbs on Hurriyat leaders had no constitutional or moral justification and the authorities were suppressing their peaceful voices with brute force and the barrel of gun. He said that Waza was stopped dozens of times from offering Friday prayers and public meeting adding that the continued detention of the Hurriyet leaders including Mukhtar Ahmad Waza is a frustration of the puppet regime. Mukhtar Waza was again today arrested and lodged in Dakhbanglow police in Islamabad. Aijaz rehmani said that the military might approach could not muzzle the Kashmiris’ just struggle for securing their right to self-determination. Pakistan Ministry of Foreign Affairs responded the US decision of suspension security assistance.